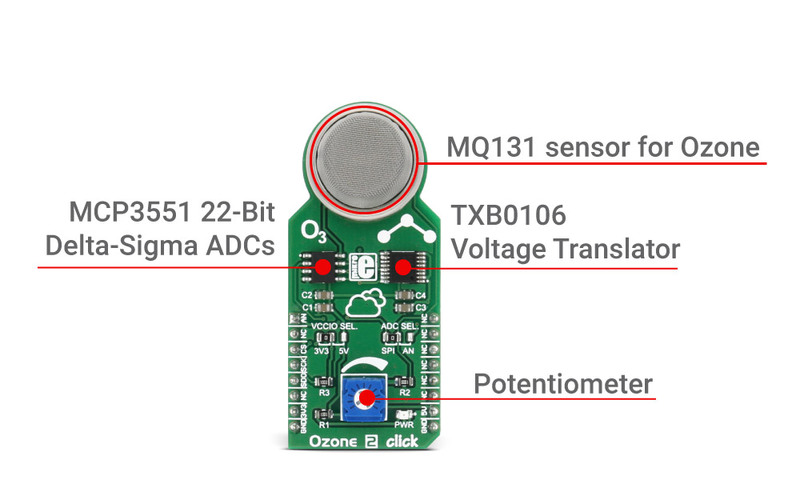 Ozone 2 click carries an MQ131 sensor for Ozone (O3). The sensor outputs an analogue voltage, which is converted by the onboard MCP3551 22-bit ADC converter or it is sent to the microcontroller via AN pin on the mikroBUS™, depending on the position of ADC SEL. jumper. The click is designed to run on 5V power supply. It communicates with the target microcontroller over SPI interface or AN pin on the mikroBUS™ line. Note: The click carries TXB0106 Voltage Translator. For selecting the interface voltage level, use the onboard jumper, and choose between the 3.3V and 5V. For more information, see the Jumpers and Settings table below. MQ131 is a semiconductor sensor for Ozone (O3). The gas sensing layer on the sensor unit is made of Tin dioxide, which has lower conductivity in clean air. The sensor’s conductivity is higher with the rising of the gas concentration. The sensor consists of micro Al2O3 ceramic tube, Tin dioxide sensitive layer, measuring electrode and heater fixed into stainless steel net. The heater provides necessary conditions for the proper functioning of the sensitive components. To calibrate the sensor for the environment you’ll be using it in, Ozone 2 click has a small potentiometer that allows you to adjust the Load Resistance of the sensor circuit. For precise calibration, the sensor needs to preheat (once powered up, it takes 48h to reach the right temperature).